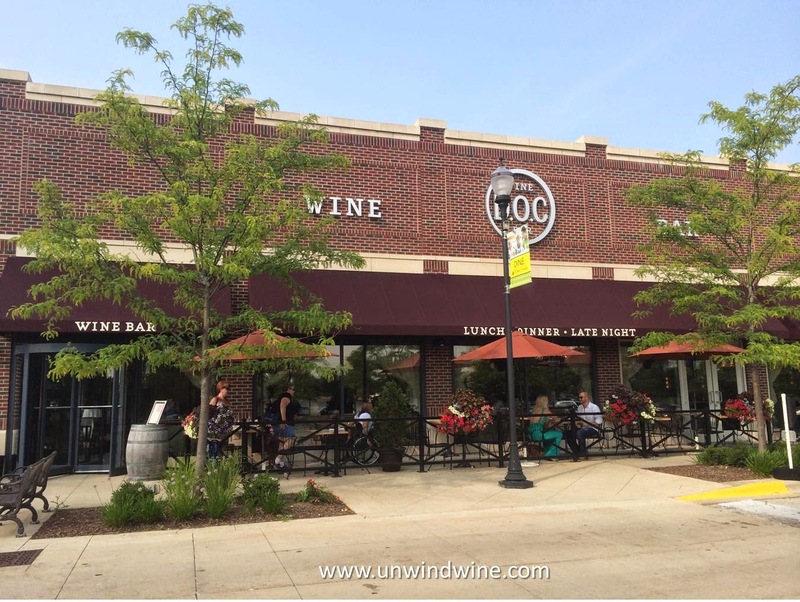 Wife Linda often works at Yorktown in Lombard on Friday evenings so we regularly meet there for a casual date night wine and dine encounter at DOC. They regularly feature a selection of wine flights - three different wines of the same style for sharing/comparing. Their menu offers mostly small plates and sides suitable for wine pairing vs an extensive selection of entrees. So it was tonight that we chose the premium Reserve Flight to accompany my selection of sushi grade Ahi Tuna and Linda's pulled pork 'sliders', with a side of our favored polenta fries. All the foods were excellent and the service was attentive, friendly and effective. The DOC folks actually have nine different locations around Chicagoland, four of those being operated under the DOC brand. Note for those so interested, their name is actually D.O.C. and stands for "Denominazione di Origine Controllata" (DOC) ("Controlled Denomination of Origin") which is Italy's equivalent of France's AOC - Appellation D'Origine Controlee or America's AVA's for American Viticultural Area. The Italian DOC, like the other Appellation designations, are a defined geographic area and its designated production for wines produced from grapes grown in that area and includes specifications for the varieties that can be used, the minimum alcohol content, the maximum yield, and the specifications for aging. The Reserve wine flight featured three bold expressive concentrated wines at the top of the range of styles from light to big and bold. Two of three of the wines were our favorite and most oft selected wines, Syrah and Cabernet, while the third was a Tempranillo, in which we rarely imbibe. We've dined there often and tonight's experience rated as the most enjoyable ever. My Ahi tuna was wonderful and the wine flight scored highest over our previous encounters, even with one gaining lower marks. Lastly, during the summer months we will dine outside and always before we dined in the main dining room which tends to be dark. Tonight we dined in their 'Tasting Room' adjacent to the main dining room, behind the bar. This casual setting with the large fireplace and couches, and our table adjacent the large windows was most comfortable and pleasant. The American centric wine selection is extensive with the actual wine list spanning ten pages - more than twenty each of American Pinot Noirs, California Chardonnays and Cabernets including popular and favored selections Robert Craig, Caymus, Silver Oak, David Arthur Elevation, Keenan, Cakebread, Darioush and Lakoya. They also offer half bottles and an extensive selection of wines BTG - by the glass. The wine prices tend to be a bit expensive, slightly more than 2x retail for bottle selections, and by the glass, and the Wine Flights are too, based on the amount of wine served for the price point. These are price points of elegant fine dining restaurants and one would hope to find more value in a casual bistro wine bar. Never-the-less, it does allow a broad selection of choices, BTG, and a series of wine flights, three different wines for about the cost of one and a half glasses, so its a good choice if one's objective is a tasting experience over a single glass of wine. For precision and the record, note that since we were pressed for time, I didn't inspect the labels of these featured selections and I know the producer's offer several labels of each of these wines. I did search for the bottles in their display case but didn't see any of these that we selected. Blend: 85.5% Cabernet Sauvignon, 13% Merlot, 1% Cabernet Franc, 0.5% Petit Verdot. Dark garnet colored, medium bodied, smooth and polished so approachable and ready to drink now for enjoyable casual sipping, almost sophisticated and complex enough for serious dining, black cherry and dark plum fruits with tones of smoke, tobacco, licorice and hint of cedar. Once again I didn't ask to see the label (which I normally do) so I am attributing my notes to their estate label. While their winelist and flight card specify Walla Walla, Oregon, I believe this is in error and they mean Walla Walla Valley in Washington. Garnet colored, medium bodied, blackberry fruits with tones of leather and cured meat, hints of pepper, smoke, earth and floral. Once again, since we were pressed for time, I didn't inspect the label of this feature and I know they offer several labels of this varietal. Garnet colored, medium bodied, more modest less expressive blackberry fruits with a layer of tobacco, smoke, tar and hints of clove spice.